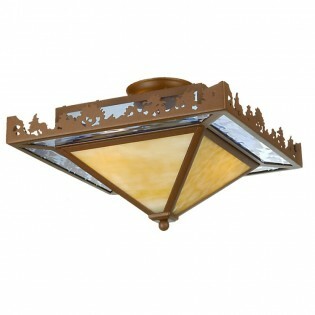 A stand of Tall pines beside a Blue lake frame the linear square shade on the Pine Lake Flush Mount Ceiling Light. A border of Blue water glass tops the illuminated Beige art glass pyramid at the bottom of this rustic flush mount ceiling light, hand finished in Antique Copper. Corner to Corner Width: 23"
Distance from Ceiling : 2.25"